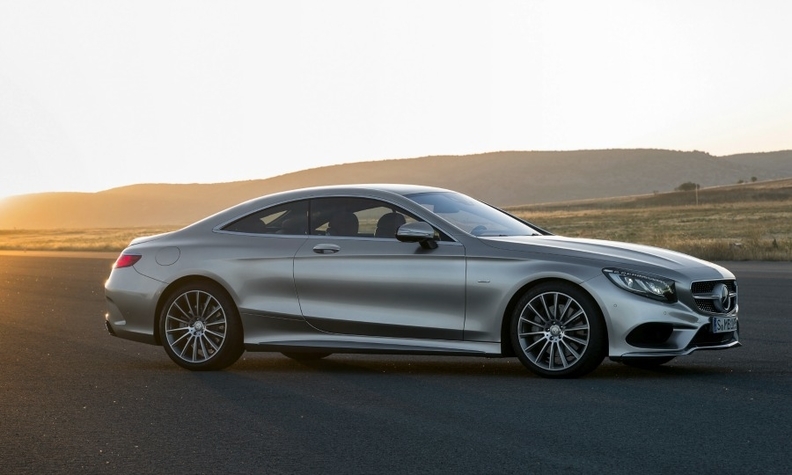 The S-class coupe has a sportier look than its CL predecessor. Mercedes-Benz expects a new name, fresh design and innovative technology will double sales of the S-class coupe compared with the model it replaces, the CL. In keeping with the brand's tradition, the coupe has technology not offered in other Mercedes models, in this case a suspension system with a curve tilting function. How does the curve tilting function work? The system adjusts the force in each suspension strut individually after a stereo camera behind the windshield and a lateral acceleration sensor register the road curvature up to 15 meters ahead. Wealthy customers who want luxury combined with standout design. Only one engine will be offered initially, a 455-hp, 4.7-liter V-8 gasoline unit. A V-12 comes next year. No diesel or hybrid powertrains are planned. Which will be the biggest markets? One-third will be sold in the U.S.; one third in Europe; another third in Asia and rest of the world. "The vehicle leans into bends much like a motorcyclist," said Hermann Storp, chief developer for the S-class line. "Our aim was not a higher cornering speed but more comfort and fun for the driver," he said. Mercedes decided to drop the CL name for the coupe version of the S class because some customers confused the CL with the smaller CLS coupe-styled four-door sedan, which is based on the E class. Mercedes expects the S-class coupe’s annual sales to be about 10 percent of the total volume of the S-class line, which would mean sales of between 8,000 and 10,000 units for the coupe. The coupe is the third variant of the new S class after the base version and an extended wheelbase variant both went on sale last year. A convertible is also planned.